Teresa McHugh has numerous trees in her North Idaho studio, none of them real. The largest tree — nearly 20 feet tall — is a Styrofoam model she retrieved from a bookstore in Boise. 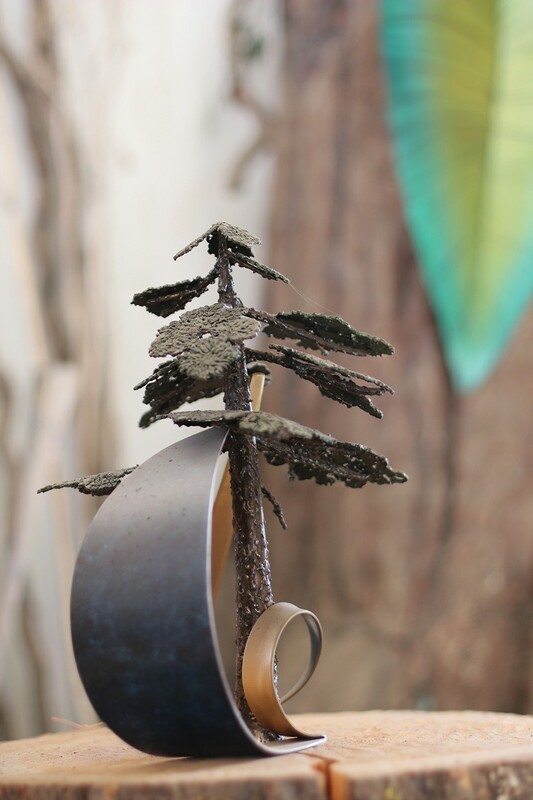 The smaller tree is made of metal, a maquette for a welded piece called Take Time, the larger version of which the Coeur d'Alene Arts Commission purchased in 2009. Given the choice, McHugh, who studied architecture in Boise, prefers working with larger sculpture and also, when given the choice, nature is her go-to motif. "I like the big stuff," says McHugh, whose work ranges from large indoor commissions, including gates, railings, fireplaces and commercial pieces (some of it on display at Spokane's Tortilla Union Southwest Grill), to even larger outdoor works like the metal sculpture of water and fish on the exterior of Kootenai Medical Center. She's particularly drawn to trees and plants, remnants of which are scattered around the studio. A dried bouquet of orange Chinese lanterns, cobalt blue bottles with stems of plants from summers past, a cluster of branches. 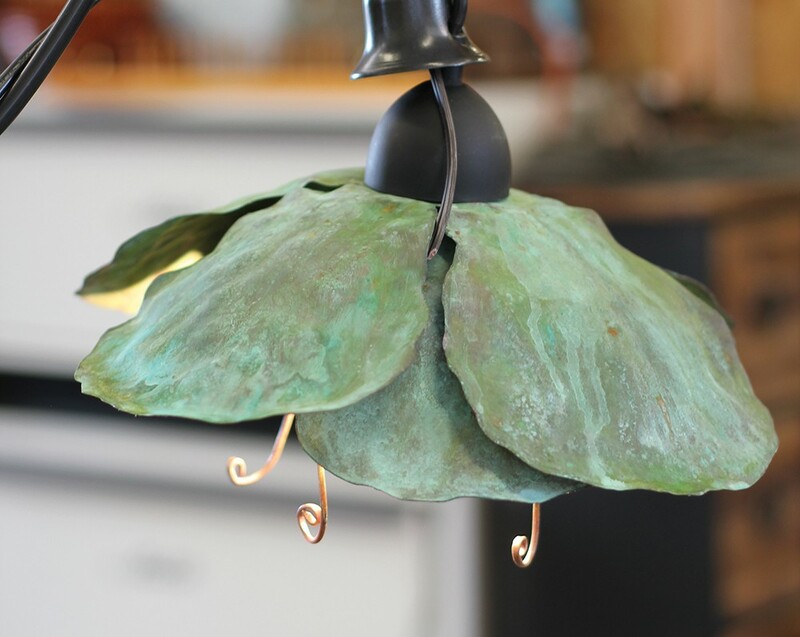 Cabbage flowers are the inspiration for her latest fascination: lamps. 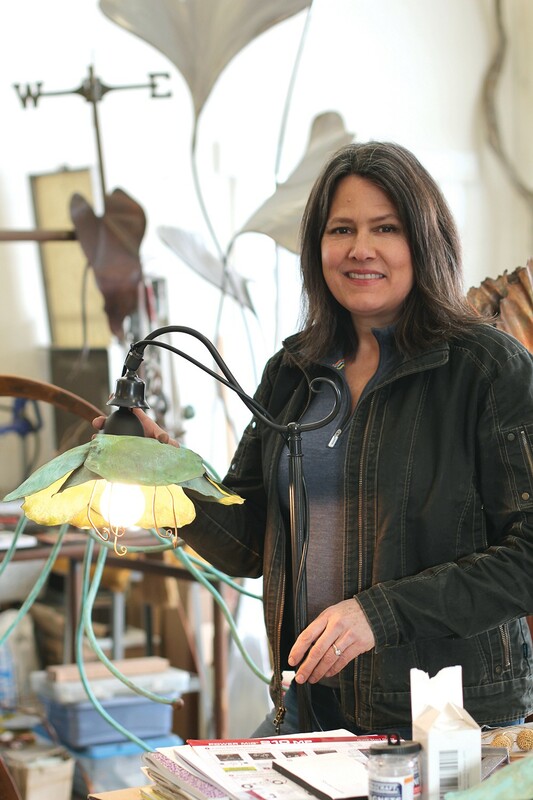 At first, McHugh repurposed lamp bases she found at a local thrift store, refinishing the metal and teaching herself how the components work to tackle wiring, then adding custom shades. She's since fabricated some lamp structures herself, although not for permanent fixtures. Because of electrical regulations governing lighting fixtures, such as chandeliers and pendant lights, she purchases certified lights, then adds custom shades. For her lampshades, McHugh cuts shapes from copper, then heats and forms the pieces into curved clusters. 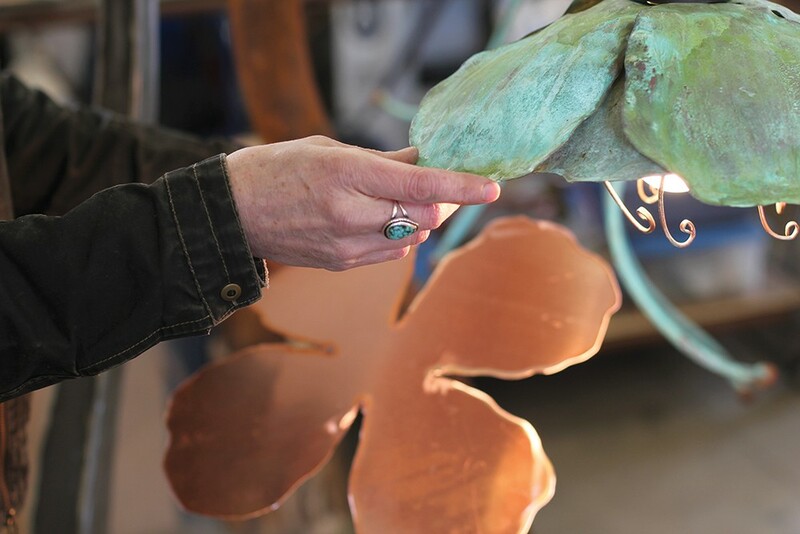 Once completed, she'll apply chemicals for a patina, typically resulting in a matte, viridian hue over the copper surface. She has a natural inclination for exploration and improvisation. "I work with several types of metal including steel, copper, aluminum and bronze, and I'm looking forward to working in stainless in the near future," says McHugh, who first got into welding while in Boise. "For years I had nothing more than a wire-feed welder, a plasma cutter and a small angle grinder. I didn't even have a drill press. I joked that I got more done with less tools than anyone I knew," she says. "Today I have three MIG (wire-feed) welders, one new TIG welder, several grinders, a drill press, oxygen acetylene tanks with several torches, plus gobs of hand tools," says McHugh, who works out of a 30-by-60-foot shop behind her Dalton Gardens-area home. "I became certified in welding because I had studied architecture in college and knew the value of quality work," says McHugh. "I wanted to be able to create work that would be solid and long lasting." Metal art and welding is only one avenue of pursuit for the versatile McHugh, who has exhibited work at the Art Spirit Gallery since 2007; you can see more at teresamchugh.com. 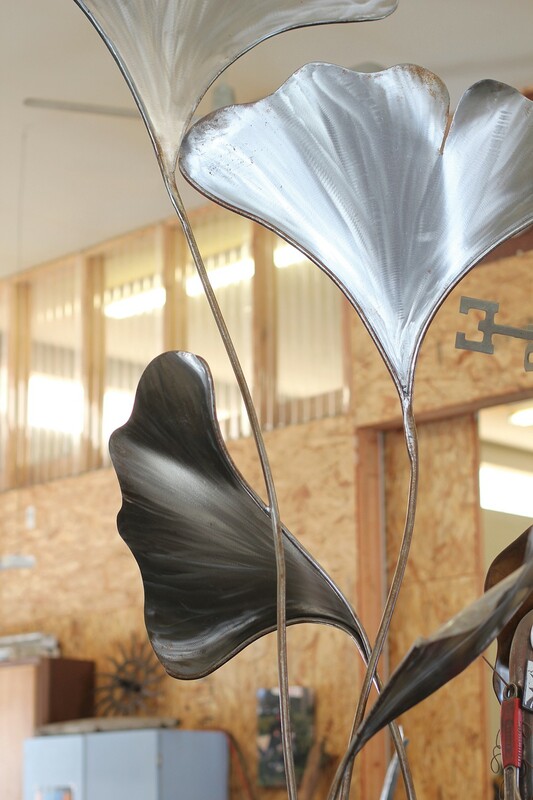 "There is garden art, custom fabrication, patina work, gallery work," says McHugh. "I've dabbled in encaustics and cold wax painting as well as acrylics. Basically I can't decide what I want to do!" The original print version of this article was headlined "The Nature of Metal"